Councillors in Dundee, Clackmannanshire and Angus have agreed their budgets for the coming financial year. Dundee City Council said it was committed to not making any compulsory redundancies and said most savings would not come from frontline services. Clackmannanshire's cost-saving measures include cancelling the development of community facilities in Alva and closing the town's pool. Angus Council announced a U-turn on plans to close sports centre creches. This followed feedback from the public. Council Tax remains frozen in all three authorities, in accordance with the Scottish government request. The finance spokesman for Angus Council, Mark Salmond, said its proposals to reduce the opening hours of recycling centres had also been ditched. Mr Salmond also said the priority for Angus was road maintenance after two periods of prolonged cold weather in the past 15 months. He said: "The four strands of our savings approach - greater efficiency, fewer staff, more focused services and increased income - are delivering the savings we need to find over the next three years and beyond." Much of the savings in the coming year would come from a reduction of staff numbers through "natural turnover", he said. Both Angus and Clackmannanshire are hoping to save about £8m in the coming financial year. Dozens of money-saving measures have been included in the budgets, including wage freezes for council staff. In Clackmannanshire, the authority said it was also postponing its funding of the Ochil Landscape Partnership and was reviewing the terms and conditions of council staff, elected members and teaching. The council's leader Sam Ovens said: "The process of developing council budgets across Scotland this year has been characterised by a level of unprecedented challenge. "All of us are aware of the financial constraints within which councils are operating and the challenge this presents in the face of increasing demand for the services we provide as well as the level of expectation we continue to face in terms of demands for increased quality and choice of services." 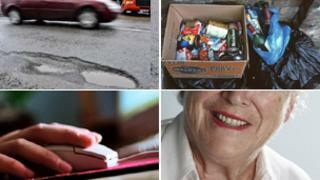 Dundee City Council will set its budget later. Among the other proposals from the SNP administration at Dundee are a £4m cut in education and the transfer of the Caird Hall concert venue to a public trust. Falkirk Council set its budget on Wednesday, announcing a raft of cuts and increases in charges in an attempt to make savings of £8.5m. Among the measures are an increase in council house rent and a pledge to cut staff costs by more than £2m. Perth and Kinross Council and Stirling Council will not set their budgets until Thursday 17 February.